Growing up in Wisconsin Dells, Jason Harder loved cooking and baking with his mother and grandmother, but it wasn't until he was laid up with a back injury one winter that he considered making food his career. "I started watching [The Food Network's] Ace of Cakes with Duff Goldman. Seeing Duff do what he does inspired me to try my hand at desserts." He made cakes for friends and family for a couple of years before deciding to go back to school for formal training. (Jason also holds a degree in meteorology from the University of Wisconsin.) 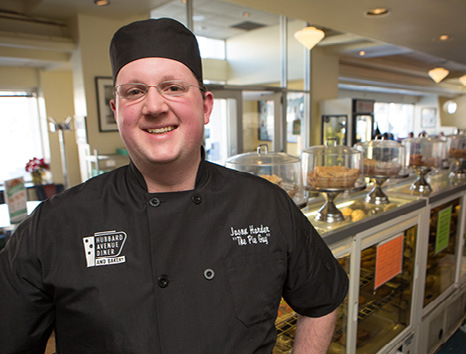 After graduating from Madison College's Baking and Pasty Arts program, Jason held an internship at Stella's Bakery where he learned the secret to their famous spicy cheese bread (and other specialties). He continued his culinary career at Food Fight as a pastry chef at Hubbard Avenue Diner, where he was later promoted to bakery manager. Food Fight's commitment to providing opportunities for advancement and promoting from within continues to impress him: "Knowing that some of the managers, general managers and even managing partners started out as a counter person, line cook or busser and worked their way up speaks volumes about how much Food Fight values its employees." While everyone may not seek out a position in a professional kitchen, Jason has "always felt that everybody should work in restaurants at some point"for the sense of camaraderie and community they create. "Restaurants are where people come together with friends and family to tell stories and share what's going on in their lives. Looking out on the dining room and seeing all the different people enjoying themselves is a rewarding feeling."